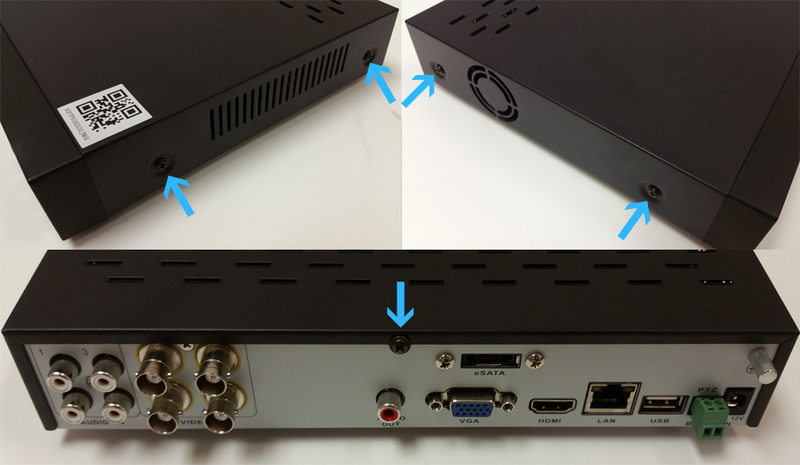 A factory reset of the 960H DVR to its original system state by erasing all of the information stored on the device in an attempt to restore the device's software to its original manufacturer settings. Performing the factory reset will wipe all data stored on the Hard Drive Disk as well as revert any settings you changed during setup back to the original defaults. The 960H has an internal factory reset button located on the motherboard. Firstly, open up the DVR by removing the five screws holding the top housing in place with a Phillips Screwdriver. Secondly, find the hard reset button located along the back side of the motherboard underneath the eSATA port next to the heat sink. Lastly, with the unit powered on to the initial start screen without being logged in, press the hard reset button without touching the motherboard until you here a beep. (Using a pen, needle, etc.) You will then see the Setup Wizard appear on the initial start screen allowing you to create a new password for the admin account and begin the initial setup once again. Reinstall the top housing and you've completed the factory reset.